Probably, this is the hardest dilemma someone ever faces while buying a pressure washer. My first experience of buying a pressure washer started with this confusion. It took me a week to decide as I stumbled upon on every possible electric vs gas pressure washer review online. This research ended at one point. My type of necessity. About three years ago, when I was looking for a pressure washer, this gas or electric confusion took me to my neighbor. He had a pressure washer already. I spent a whole day with him about this. He asked me one thing. What are you going to do with a pressure washer? My answer was, “I’m gonna wash my car. Nothing else.” And there was the end of confusion. I finally ended up with an electric pressure washer. This is not going to be a case study, I am just going to share my thought (from experience) on this situation. Surely, you are going to find the exact pressure washer for your need. The first step is to identify for which purpose you need a pressure washer. Ring any bells? These are the most common uses of a pressure washer. You need to identify what exactly you are going to do (mostly) with your pressure washer. I hope you already know what you are going to do with your pressure washer. This is the time you get an idea about pressure washer’s cleaning power. Simply, Cleaning power = PSI X GPM. You can understand, the more the cleaning power the more work a pressure washer can perform. 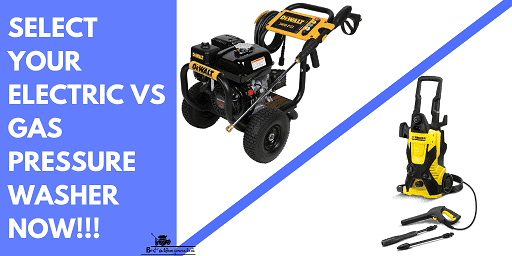 Now you can easily compare gas vs electric pressure washer on your own. The harder the cleaning job it is, the higher the cleaning power you are going to need. You might have gathered some knowledge of gas and electric pressure washers. Let’s have a look in details about the two types of pressure washers. Electric pressure washers are popular in the market. Because they are very efficient in lightweight cleaning jobs. Statistically, someone who owns a car owns an electric pressure washer. Cleaning car is a lightweight job and there is no necessity of huge cleaning power. Splitting the pros and cons of electric pressure washer would give us a greater perspective in this. As you can see, electric pressure washers are the best option for lightweight works. In my opinion, this is the type of washer that can is perfect for every homeowner. In my case, I had issues with my neighbor just because of his gas pressure washer extreme noise. Definitely, I bought an electric pressure washer. Cleaning my car was the only priority for me. This type of pressure washer is a good fit for car cleaning, patio, tiles and window cleaning. A maximum of 2000 psi with 1.8 GPM pressure washer is more than enough for this kind of works. Does any of these jobs are working in your mind? Then an electric pressure washer is the right one for you. This is a matter of power. Gas pressure washers are extremely powerful. For any type of cleaning work around the house, a gas pressure washer is an excellent choice. The gas engine generates more power than the electric motor, making it a better choice for a heavy cleaning job. Heavy cleaning job like cleaning mildew from vinyl siding is a good job for gas pressure washer. This type of cleaning job requires a healthy amount of cleaning power. Let’s focus on the pros and cons to get a clear look on this category. The fun part is, electric pressure washers range around 2000 psi maximum. Gas pressure washer psi range starts from here. 3000 psi gas pressure washer is the most common range. Both electric and gas pressure washer offers great values. You need to stay on these points and find the best one for you.